The trillium in these two have bright yellow green shading in their centers. They'll be mounted on the large leaf print to finish them. That will get done when I go to the cottage, since they're destined for Good Good's Gallery in Saugatuck, Michigan. In the meantime, I'm knee deep in smocked clothing and boxes of "paper." A whole lot of my smocked stuff is being donated to the Lacis Textile Museum's (Berkeley, California) permanent collection. An exhibition featuring smocking is scheduled for early next year. Getting my donations documented, and packed to send off before we leave is taking a lot more work and time than I had imagined. I'm not having any fun with this and fantasize about dumping it all in boxes to let them sort it out. This means I most likely will not post here again until I'm relocated up north. 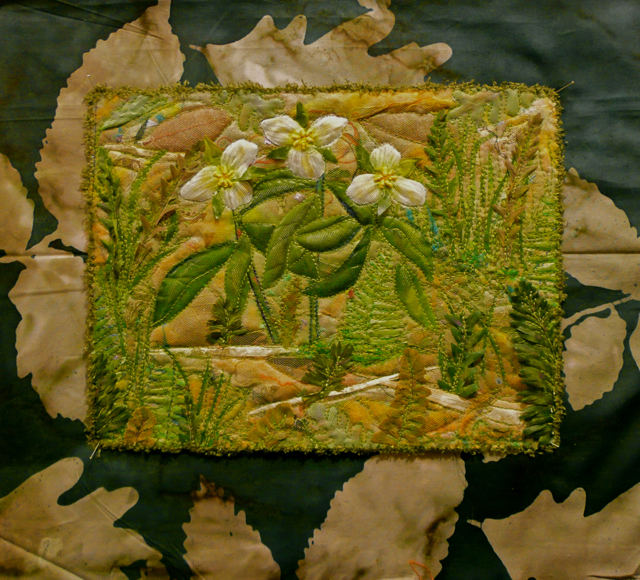 These trillium quilts just get better and better - another beauty here. Making is always more enjoyable than documenting! Hope you get it all done in time and enjoy your summer getaway. Beautiful Trilliums.....hope you finish asap and get to the lake house. It is beautiful now and warm. A beautiful piece of work, love the colours and textures, your trilliums are fabulous. Hi, Nellie. Glad to see that you're forever inspired and producing lovely artwork. The textures and colors of the trillium series are exquisite. Leona Harden from Turbo Quilter sent me to your blog. I am going to have fun looking at your beautiful Art.